President Donald Trump ratcheted up the pressure on the eve of the meeting by accusing China and the European Union of artificially weakening their currencies. As the U.S. wages a global trade war — with new battles starting almost daily — the Group of 20 finance ministers will try to find common ground where they can, and likely debate tariffs and exchange-rate policy when they gather in Buenos Aires this weekend. This marks Mnuchin’s second trip to the Argentine capital for meetings of G-20 ministers. During his first visit in March, the secretary faced harsh criticism from his counterparts, and was publicly rebuked three months later by peers at a Group of Seven finance ministers summit in Canada. Since then, Trump has upended the economic policy playbook, lambasting China and the EU for their weak currencies and the Fed for raising rates. He said a stronger dollar and rising interest rates are undermining America’s “competitive edge.” The comments open a new front in the trade war that may prompt central bankers in Buenos Aires to defend their monetary policies. If Mnuchin’s recent trips to global summits are any indication, talks this weekend likely will result in him facing a barrage of criticism from world peers, in tense discussions that ultimately will do little to sway U.S. policy. The meetings will make plain America’s retreat from allies and global forums that some critics warn is reducing U.S. influence over world affairs. “The U.S. is fast losing its ability to drive the global economic agenda and provide leadership in tackling problems and issues that have a global rather than just national scale,” said Eswar Prasad, a professor at Cornell University who previously worked at the International Monetary Fund’s China division. After imposing steel and aluminum tariffs on most G-20 countries, the United States is considering new duties on imports of automobiles and uranium. Trump also has slapped 25% tariffs on $34 billion of Chinese goods and said in a CNBC interview that aired July 20 he’s “ready to go” with $500 billion in tariffs on imports from the Asian nation. The People’s Bank of China Deputy Governor Chen Yulu declined to comment when asked in Buenos Aires about Trump’s latest threats on tariffs. White House officials say Trump is pressuring trade partners to lower barriers to American goods, though so far his actions have resulted in retaliatory tariffs on U.S. products. The administration says the long-term benefits of a more open playing field for American firms will make the short-term pain of tariffs worthwhile. IMF warned this week the escalating conflict poses the biggest risk to the global economic recovery, after long arguing that countries should avoid protectionism and turn to multilateral bodies such as the World Trade Organization to resolve conflicts. Rather than pay heed to its warnings, Treasury officials have turned up the heat on IMF and other global forums for critiquing U.S. policy. “We are working every day to guide multilateral financial organizations toward a limited role that is more consistent with free markets, faster growth and U.S. national interests,” Mnuchin told Congress in a July 12 hearing. The Treasury Department also is increasingly focused on economic sanctions rather than international affairs and diplomacy. 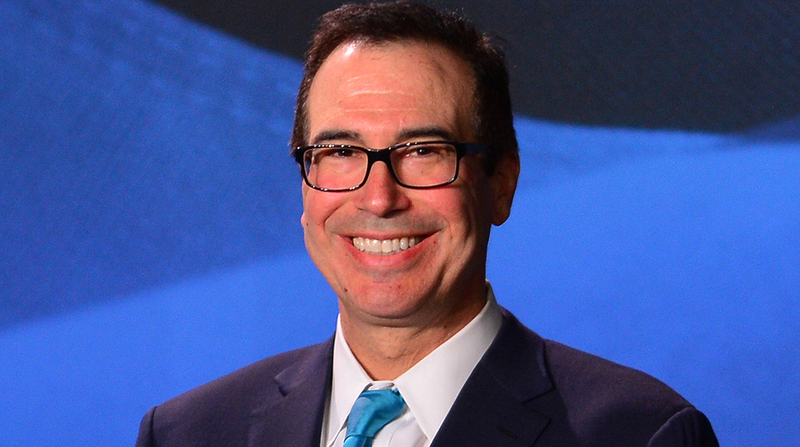 Mnuchin repeatedy has said that he spends more than half his time working on sanctions, which the Trump administration has at times imposed unilaterally. European allies — now called economic foes by Trump — chafed against the U.S.’ decision to withdraw from the Iran nuclear deal. A spokesman for the European Central Bank declined to comment on Trump’s accusation about gaming the euro. Mnuchin, who travels to Argentina after meetings in Brazil, is scheduled to hold about a dozen bilateral meetings and informal talks on top of the official G-20 proceedings. There is one notable exception: Mnuchin has no plans to meet individually with Chinese officials, which is a missed opportunity to ease trade disputes between the world’s biggest economies. Trump on July 19 singled out the Chinese currency when it slumped to a one-year low as the central bank showed little sign of intervening. China’s markets ended July 20 on a stronger footing though, with the yuan reversing an early decline. The yuan has depreciated more than 4% over the past month, the steepest among major currencies. A weaker yuan makes Chinese exports more attractive and imports more expensive, which could inflate its trade surplus with the United States. The Treasury’s press office didn’t respond to requests for comment on the depreciation. If past international forums are a guide, Mnuchin probably will deny the United States is losing influence and instead seek to emphasize areas where most countries can find common ground, such as cybersecurity and countering terrorist financing. But Japan expects G-20 participants to discuss trade frictions, especially given the threat that the dispute will hit other economies, according to Finance Minister Taro Aso. Japan also has threatened to act if Trump slaps duties on car imports, after refraining from retaliation against his tariffs on their steel and aluminum exports. With assistance from Raymond Colitt, Reade Pickert, Paul Jackson, Andres R. Martinez, Ye Xie, Katharina Rosskopf and Felipe Marques.